In this chapter I will explain the concept of hidden pins. To do this, let’s concentrate on the 595 integrated circuit. This IC is interesting because it contains hidden pins. Take a close look at the 595 component. The power pins are not visible. They do exist in the schematic, but they are invisible. You can see here that unlike the real 595 part, there are two pins that are missing, those are the power pins. The real 595 part has one pin for Vcc and one pin for GND. In the Kicad schematic component for the 595 IC, you can make those pins visible by going to the schematic editor options and clicking on show hidden pins. …Check the “Show hidden pins” option, and click OK. When you do that, you’ll see pin 8, and pin 16, which are VCC and ground respectively. The hidden pins are revealed. Hidden pins are… hidden because KiCad expects that somewhere in your schematic are nets that are marked as power nets. 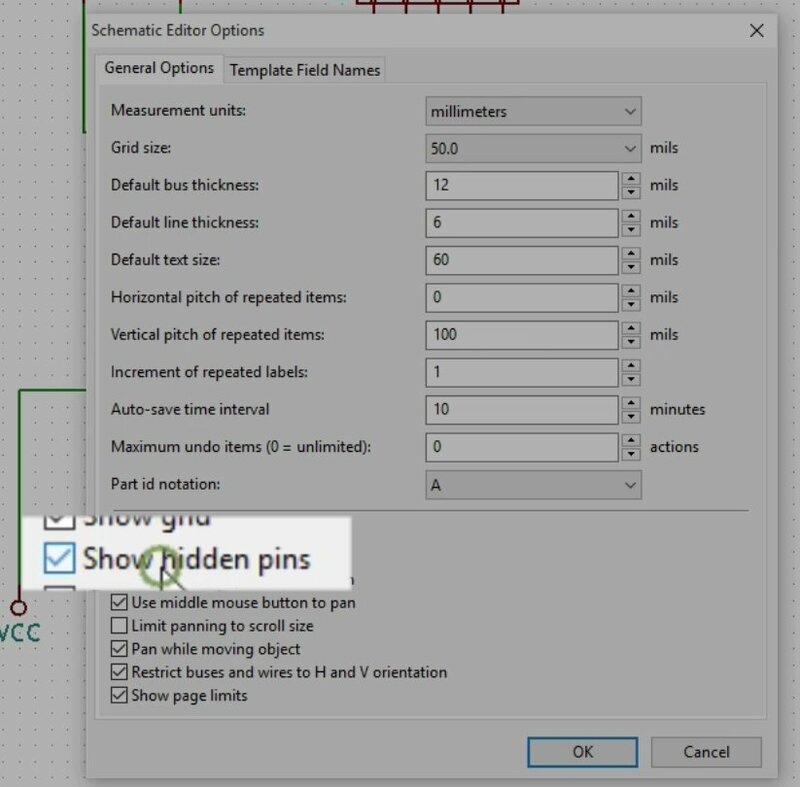 In the background, Kicad will automatically connect pin 8 and pin 16 to those nets. In our schematic, we already have Vcc and GND nets, but they’re not marked as power nets yet. Before we mark the power nets, restore hidden pins to their default state so that that they are invisible. In order to mark a net or a connection or wire as a power net, you will need to use the power flag. The power flag is just another component, except that it is not really an electrical component. 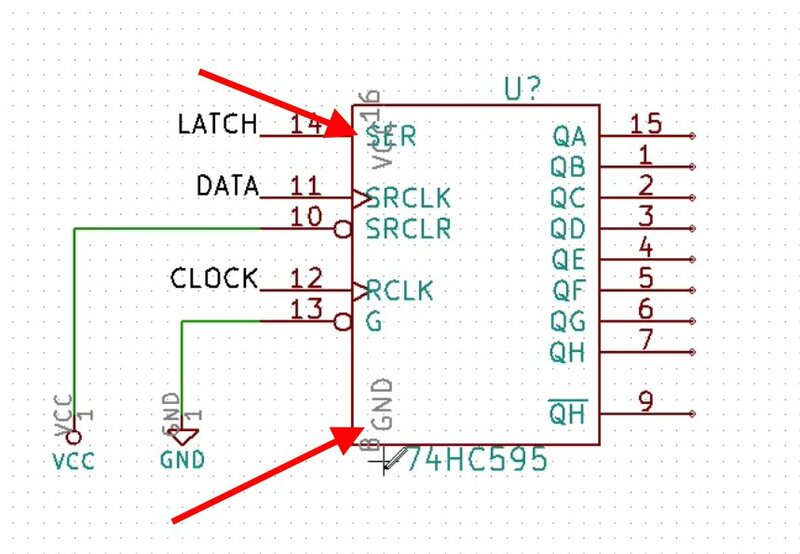 It’s a KiCad component, or a component that KiCad uses with its rules check to confirm that hidden pins that require power are indeed connected to a power net. 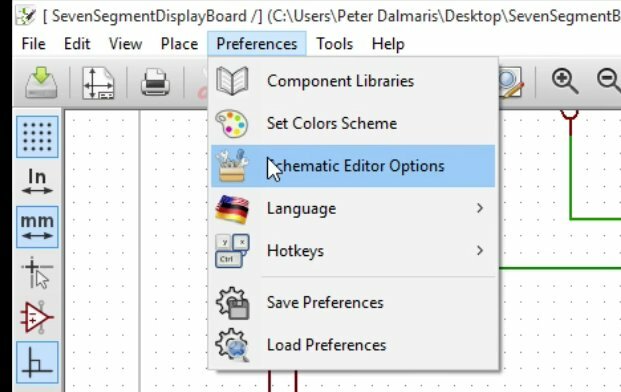 Hit the “A” key to bring up the component chooser, and use the filter to search for the power flag. Type “PWD”. 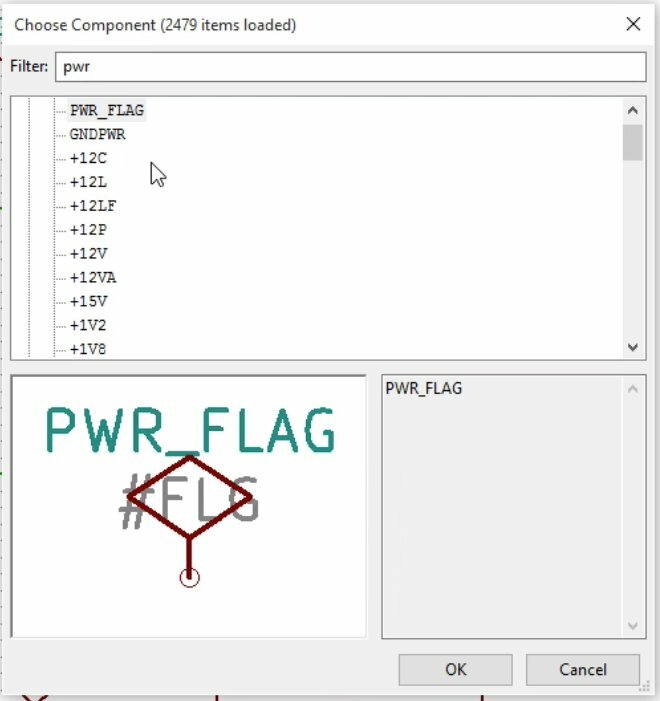 Use the filter to find the PWR_FLAG component in the components chooser. The GND and Vcc nets are marked with the PWR_FLAG. 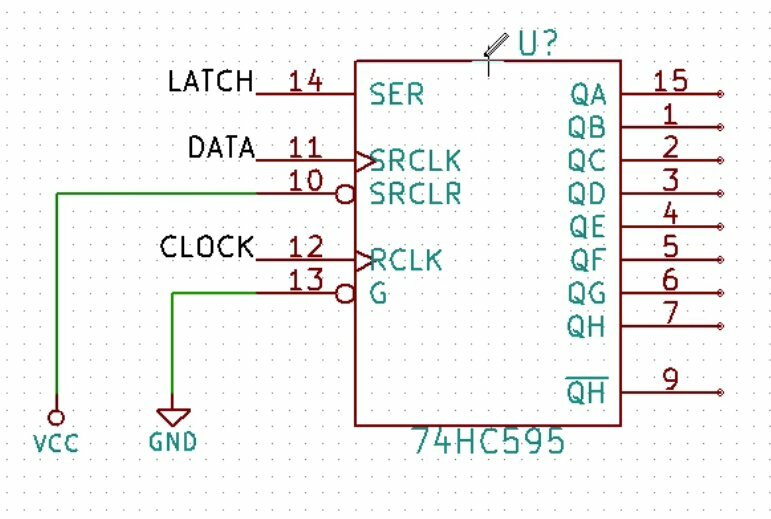 If you do an ERC now, you will get error reporting that various pins are not connected to anything, but you will not get any errors concerning the GND or Vcc hidden pins of the IC. Those are now connected to the GND and Vcc nets in the background because Kicad is informed of their existence. With this taken care of, let’s move to the next objective: connecting the data pins of the IC to the resistors and the LEDs. We could use normal wires to do this, but you can imagine that the schematic would be very busy. Instead, we will setup a data bus. In the next chapter, I will show you how to make multiple connections using a data bus.